"Free Date Night", that got your attention didn't it? 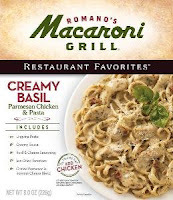 While I can't take care of arranging babysitting for you, I can offer, with the help of Wanchai Ferry and Macaroni Grill and myblogspark.com, a chance to win two dinner kits and a a $25 Visa Gift Card! MyBlogSpark also sent me a prize pack to re-create a date night with my hubby! Unfortunately I had to hold onto the dinner kits for quite awhile until David returned from training in Arkansas. So... I was really antsy to make these two dinners when he returned! 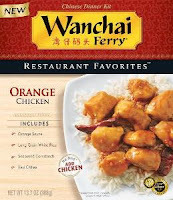 MyBlogSpark gave me a Wanchai Ferry Orange chicken boxed dinner kit and a Macaroni Grill boxed dinner kit. I went ahead and made both of these on the same night so we could compare the one we liked best. They were both really good and taste wise they were neck and neck. I found the orange chicken to a little less hassle though with fewer packages to open and less steps. All I had to do was add diced chicken breasts! These are quick and easy dinners that taste just as if you were going to a restaurant but in the comfort of your own home! Just become a follower of my blog or subscribe to have an entry to win these two dinners and a $25 Visa card. Leave me a comment that you did so. Thanks to MyBlogSpark for giving my hubby and I an awesome date night in! Following your blog. Thanks for this conest. Just signed up for an email subscription. i'm following your blog on Google Friend Connect.